Safdarjung Railway Station is the hub of activity as an exciting sojourn across the never-never lands is just about to begin. 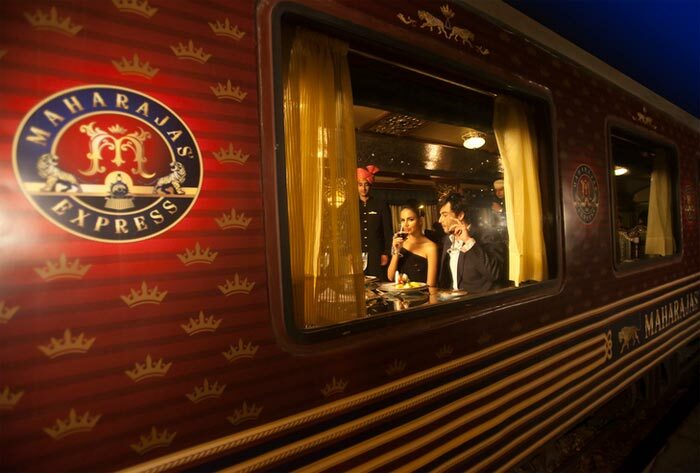 The Maharajas’ Express is especially decked for you and the the Indian Splendor tour is shortly about to commence. Your first destination is Agra, the land of the Taj. A visit to the Taj is perhaps a dream come true for millions of tourists from all over the world and no trip to India can be rendered complete without a visit to this ultimate architectural masterpiece. After you have explored the Taj Mahal, enjoy a high tea experience atop the Taj Khema and return to the train to continue your sojourn to the next destination. Dinner aboard the luxury train. Visit the wild animals of the Ranthambore National Park in their natural environs and surrender your day completely to nature. On your arrival back in the train, you will be served a leisurely brunch while you will proceed towards Jaipur, the capital city of the Rajasthan. Popularly known as the ‘Pink City’, Jaipur has in store museums, Fort Amer, shopping arcades, jeep safaris and even an exhibition Elephant Polo Match. Once you have reached Jaipur, you could stay back in the train for some leisure moments or begin your sightseeing trips across city; the choice is completely yours. Post the exhibition match, dinner will be served in a private venue along with choicest wines. The desert city of Bikaner offers an eclectic mix of rugged deserts, bedecked camels and excited tourists who want to capture every bit of the city in their memories to carry back home with them. Bikaner, an erstwhile princely kingdom, is today home to several medieval palaces and forts and a number of well stocked museums too that facilitate the guests with an easy understanding of the legacies surrounding it. The noteworthy places to visit here are Lalgarh Palace, Junagarh Fort and the Deshnoke temple. While here, also make it a point to be a spectator to the spectacular performances of the local musicians and dancers in the sand dunes of Bikaner. This musical extravaganaza in the evening will give a tremendous boost to your the Indian Splendor sojourn. Welcome to the Blue City of India, Jodhpur. Some of the premium examples of Rajputana art and crafts can be seen here. An early morning village safari across the Bishnoi village will more than refresh your senses. Return to the train for lunch and later leave for exploring the Old Clock Tower and the Mehrangarh Fort. Do not miss to relish a tasteful barbeque experience while at the Mehrangarh Fort. Overnight stay aboard the luxury train. Udaipur offers a sharp contrast as compared to the rugged locales of Jodhpur and Bikaner. The Lake Pichola besides adding beauty to the city, also helps keep the ambience cool. It is also home to the magnificent Lake Palace and several boating activities also take place here. In Udaipur, the topmost attractions that you can visit include the City Palace and the Durbar Hall. Post lunch you could relax in the spa of a heritage hotel or return to the train to explore its luxury amenities. Later, you could walk through the old market of Udaipur to savor on the local delicacies besides indulging yourself in loads of shopping as well! Today’s itinerary include trip to Dinosaur Fossil Park, one of the largest in the world followed by a village tour to give you a peek into local culture and ways of life. The activities of the day conclude with a lavish lunch and meeting with the royal family. As all good things come to an end, so will the Indian Splendor tour onboard the Maharajas’ Express. You will arrive in Mumbai early in the morning on the 8th day of the journey. Have a leisurely breakfast in the comfort of the train. After disembarkation, explore Mumbai for more sightseeing or return home, the decision is ultimately yours! If you have not decided yet or wants to customize tour itinerary or hotels listed above in "Indian Maharaja Express Luxury Train Tour Package", then we can change the travel itinerary and make a personalized, tailor-made holiday package, especially for you. We can modify this travel package as per your itinerary, budget, duration and the tourist places you would like to visit, including transportation and airfare should be included or not. Please fill the form below to contact us.